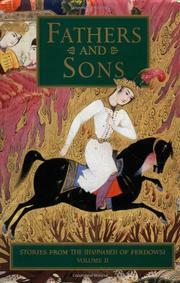 The second installment in Davis’s expert three-volume prose selection of episodes from the 11th-century epic poem that comprises a vivid romantic history of Persia up to that time. The seven tales herein concern the fates of nobly born Seyavash and “lion-hearted” Esfandyar, exiled by their jealous fathers (a common theme, this, in classical Persian literature)—notably, the former’s attempts to escape the clutches of his insanely amorous stepmother, and the latter’s alliance with the legendary warrior Rostam (whose exploits and sorrows are also chronicled in Matthew Arnold’s narrative poem “Sohrab and Rustum”).This volume also offers the limpid “Bizhan and Manizheh” (an analogue of Romeo and Juliet), and a cornucopia of absolutely gorgeous illustrations taken from 16th- and 17th-century manuscripts. Storytelling in the grand manner, most authoritatively and impressively produced. This is irresistible stuff.